ECO HI SOLAR is MCS-accredited for the design, installation and service of solar photovoltaic and solar thermal systems. We are passionate in our belief that solar energy must be exploited as one of several renewable energy resources in the urgent need to drive down reliance on fossil fuels and thus help reduce our contribution to greenhouse gas emissions and global warming. You will benefit by receiving payments - the Feed in Tariff (FIT) available for solar PV installations, and the Renewable Heat Incentive (RHI), for solar thermal installations. These incentives enable significant earnings to be made as well as considerable reductions to our electricity demand and thus carbon footprint whilst at the same time investing in renewable energy technologies which will help in securing our energy future. ECO HI SOLAR uses the latest technology and techniques and offers straightforward solutions at affordable prices which combine seamlessly with existing energy systems in our homes and businesses. We operate in the South East UK (West Sussex, East Sussex, Hampshire, Surrey, Kent and London). Our offices are in southern England in Brighton and Hove where we work with local County Councils, Renewable Energy Initiatives (e.g. OVESCO in Lewes), architects on new-builds and businesses such as property developers. "I am a totally satisfied customer. They did not exaggerate the product but explained everything fully. The installation of firstly Solar Water Heating, and then a year later Photo Voltaic electrical generation, was done very neatly with a minimum of fuss. We had them fit Photo Voltaic because of the good job they did with Solar Water installation. It is a very neat and solid installation." "We dithered for a year over our choice of product and positioning, with never a complaint from Cleland. EcoHisolar were constantly polite, helpful, friendly, professional and knowledgeable, with no sales pressure at all. Installation was painless, on time and budget, and after sales service, even 12 months later, is still excellent. Highly recommended"
"Good email exchange before going ahead with discussion of products, etc. Installation went very smoothly, minor problem resolved without fuss. Wouldn't hesitate to recommend or use again myself if I had another solar project to commission." "I am a totally satisfied customer having both a solar thermal system and solar photovoltaic installed by Eco Hi Solar. They did not exaggerate the product but explained everything fully. The installation of firstly Solar Water Heating, and then a year later Photovoltaic, was done very neatly with a minimum of fuss. We had them fit Photo Voltaic because of the good job they did with Solar Water installation. It is a very neat and solid installation. I was a total sceptic but was proved completely wrong!" "Helpful, committed, responsive & well organised and thoughtful on site." "Eco Hi Solar were great. They gave very good advice and told me about all the different options for solar thermal, explaining the pros and cons of each. They also had no problem working with our plumber to link up the solar thermal with our woodburner, which heats the water in the winter months." "So pleasant to deal with, and so good at thinking round corners to suit our old cottage & overcome any problems that arose. We were kept fully informed at every stage & all workmen were efficient, skilled & extremely professional. We then had solar PV installed by the same company & are delighted." "We had a solar thermal system fitted with Eco Hi Solar initially. They were so pleasant to deal with, and so good at thinking round corners to suit our old cottage & overcome any problems that arose. We were kept fully informed at every stage & all workmen were efficient, skilled & extremely professional. We then had solar PV installed by the same company & are delighted." "Excellent supplier capable of giving enthusiastic advice and carrying out work promptly, efficiently and in a friendly manner." "As a Renewable Energy Consultant, I have used Eco Hi Solar for several installations in the South East. They have all been carried out in an efficient and friendly manner, leaving the customer extremely happy." "Eco Hi Solar inspired confidence from the start and has a straightforward, knowledgeable, friendly and helpful approach. Everything happened as planned, neat work and system working successfully. Our system combines solar heating panel, wood-burning stove back boiler and two immersion elements with one hot water tank." "We dithered for a year over our choice of product and positioning, with never a complaint from Cleland. 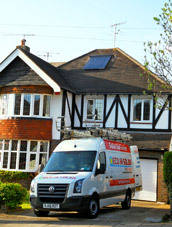 Eco Hi solar were constantly polite, helpful, friendly, professional and knowledgeable, with no sales pressure at all. Installation was painless, on time and budget, and after sales service, even 12 months later, is still excellent. Highly recommended." "Excellent service throughout. Eco Hi Solar is a very professional outfit with knowledgable and friendly advice. The installation process was completely painless, with everything explained well in advance and all works completed exactly to the agreed schedule. The installation is neat and unobtrusive, and I have been proud to show it to many friends and interested neighbours. The system has worked well from day 1 and although commissioned just before a period of extended cold weather, has given solar input on many days. I look forward to sunnier times to really get the best out of it." "I had a solar system installed by Eco Hi Solar [to integrate with my wood burning stove] who were great. They gave very good advice and told me about all the different options for solar thermal, explaining the pros and cons of each. They also had no problem working with our plumber to link up the solar thermal with our woodburning stove, which heats the water in the winter months. I would definitely use this company again"
"Very helpful, friendly and knowledgeable"
"We had a PV system using installed to generate electricity by Eco Hi Solar. They were very friendly, helpful, efficient, and provided excellent service. We would recommend this company." "Job done on time and to budget, great after sales service." "Eco Hi provided very prompt, friendly & efficient service when we asked them to install our PV system. The work was carried out quickly and efficiently on the agreed date and although there was quite a bit of paperwork involved we were helped through the process. They are everything that a local installer should be." "Eco Hi Solar provided very prompt, friendly & efficient service with the work being carried quickly on the agreed date. Everything that a local installer should be." "Can I just say how delightful it has been to have you working for us. It is rare that we have ever had work done so well, so diligently and so politely. And tell your electrician I don't think I have ever had any electrical work done where I have come home and not had to tidy things up or straighten trunking! Very Very Impressed." "We had a solar thermal system installed by Eco Hi Solar who provided excellent service throughout. Eco Hi Solar is a very professional outfit with knowledgeable and friendly advice. The installation process was completely painless, with everything explained well in advance and all works completed exactly to the agreed schedule. The installation is neat and unobtrusive, and I have been proud to show it to many friends and interested neighbours. The system has worked well from day 1 and although commissioned just before a period of extended cold weather, has given solar input on many days. I look forward to sunnier times to really get the best out of it." "Professional Enthusiastic Knowledgable Top quality workmanship Excellent back-up if needed." "Very friendly, helpful, efficient, and excellent service." "Eco Hi Solar fitted my solar hot water system 3 years ago, I have had no problems and find the saving especially in summer with my boiler off reduces my bill considerably. The standard of work installation was excellent, and included a very awkward tank fitting. Technical matters and how to use was explained very clearly. I have nothing but praise for a very friendly and efficient service." Solar PV systems generate electricity which can be used instantaneously by the household or business, whilst any surplus electricity generated is fed directly to the national-grid. The Feed in Tariff (FIT) is an incentive scheme initiated by the government and managed by your electricity provider. The payment rates are fixed for 20 years, linked to the Retail Price Index (RPI) and are tax-free. We use a wide range of modules and components and use fully qualified engineers and electricians to design and install our systems. Component manufacturers include LG, SANYO, Mitsubishi, DAY4 Energy, Sharp, Upsolar, Schuco, Schott, TG Solar, Romag, Hyundai, SMA, Goodwe, Enphase, Solar Century, Mastervolt, Power-One, Solis, SolarEdge, Tigo, Fronius, Intenergy, KACO, Enecsys, Yingli, JA Solar, Bisol, Voltec, Amerisolar and Ever Solar. Solar thermal (ST) systems utilize the sun’s energy by generating heat. This heat can be transferred to hot water, swimming pool and central heating systems. The Renewable Heat Incentive (RHI) was introduced in 2014 and rewards owners by paying a deemed amount for a period of 7 years. During the summer months a ST system will heat a hot water cylinder with almost no additional assistance while in the winter months it can make a significant contribution, so saving on fossil fuel bills and helping reduce environmental pollution. We design and install solar photovoltaic, grid-tied (PV) and solar thermal (ST) systems. Advanced, affordable technology converting sunlight into electricity and heat.